Armaan Kapur has posted his response in a tweet as well as in the comments here. Scroll to the bottom for updates. While we have had our share of social media blunders last year, this February the quota has been inaugurated by Starbucks India. In a move that can be called almost suicidal on social media, the iconic coffee brand went on to delete a Facebook post by an irate customer. The post shared about crass treatment meted out to him at one of the stores in Delhi and had more than 5K likes with 293 comments, at the time of being deleted. Armaan Kapur, a writer and designer had been refused entry when he visited the Starbucks Delhi store along with a friend. The bouncer did not believe Armaan that a friend was already waiting inside with two vacant seats for the two of them, and asked the duo to move back in the queue. Yes, Starbucks in India has never ending queues. The two let it go as they were in a hurry and called up the friend to get the takeaway for them. But, then something disastrous happened – the bouncer and a friend of his asked Armaan and his friend to step far away from the glass and move away from the store itself. Further, a Starbucks employee asked them to stop making a ruckus. So much for crowd control! Following this appalling incident on the 7th of February, Armaan wrote to Starbucks India in a Facebook post where he described the shocking experience of that day and stated that he won’t be compelled to return and get brushed away by their idiotic security guards. The said post soon gathered momentum and had garnered 5177 likes with 293 comments. Rather than take note of this complaint and apologize for the lousy treatment to Armaan and his friend, the Starbucks Facebook page deleted the post 5 days later on the 12th of February. A screenshot of the post was also deleted immediately from the Starbucks international Facebook page. A screenshot remains as evidence to this dastardly act. Since then Armaan has been posting this screenshot on his Facebook as well as Twitter pages, which is when it caught my eye. Apparently, brands do not bother much about their online reputation, because it is highly improbable that Starbucks India deleted the said post being unaware of the social media implications of this act. It only required issuing an honest apology to Armaan and his friend and possibly making up with some free coffee. Enough said! Remember the Volkswagen India Twitter blunder where a Twitter campaign went all rogue and in response the Twitter handle posted a sexist tweet. The tweet was immediately deleted following the backlash but no apology was issued. Three and a half days later, it said the account had been compromised and the issue was being investigated upon, but still there was no apology. The account is operative now but the scars refuse to go. A brand with out-of-the-box social media campaigns has now mellowed down to mediocre campaigning. 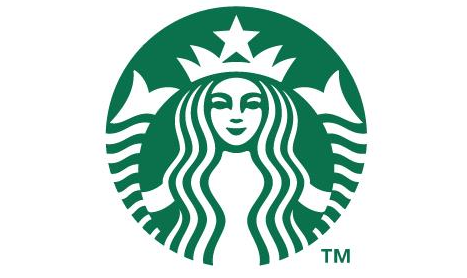 Starbucks has had a PR crisis in Argentina, but following the online criticism which quickly went viral as the top trending topic in Argentina, it apologized and blamed the crisis as an internal planning mistake. The brand did apologise but only after the criticism went viral. It remains to be seen when Starbucks India will apologise to Armaan. Blame it on the long queues or bring more stores on board, but do not be rude to a customer and never ever delete his online complaints. Remember the internet never forgets! P.S. We are trying to contact Armaan Kapur and Starbucks India to get their points of view, and will update the post as and when it happens. “Longer version. #Starbucks #StarbucksIndia Despite the comparatively late up-take on Twitter, the retweeting, liking and favouriting must’ve gotten to them. They found my email add, asked for my details and invited me over to meet them. I took the same two friends I’d previously gone with, incase the manager was in the mood for some corroboration. A Tata head took me aside and asked me to explain the situation, offered us free coffees and apologised profusely (I later realised it was the same man who’d ignored us the first day we’d gone there, we’d mistakenly thought he WAS the manager). Anyway, the actual manager dropped by for a brief moment too. I wasn’t looking to extract anything, and just reiterated that their PR was a mess for a) initially giving me a premeditated response b) deleting my post and leaving me be to simply wreak havoc on the brand reputation. He nodded genially. I’m considering whether I should repeat our exact predicament (friend inside and waiting, two outside, trying to get in) to see if they’ve actually changed. But then again, is any of it worth it? #Firstworldproblem or not, a cup of coffee and their lax management can’t be my biggest headache”. 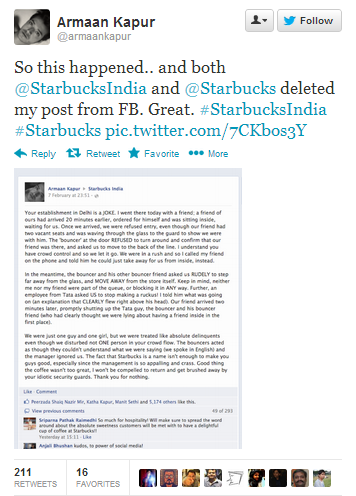 UPDATE 2: Starbucks India has responded to us via a Facebook message, saying it did not delete the said post. Read more here.